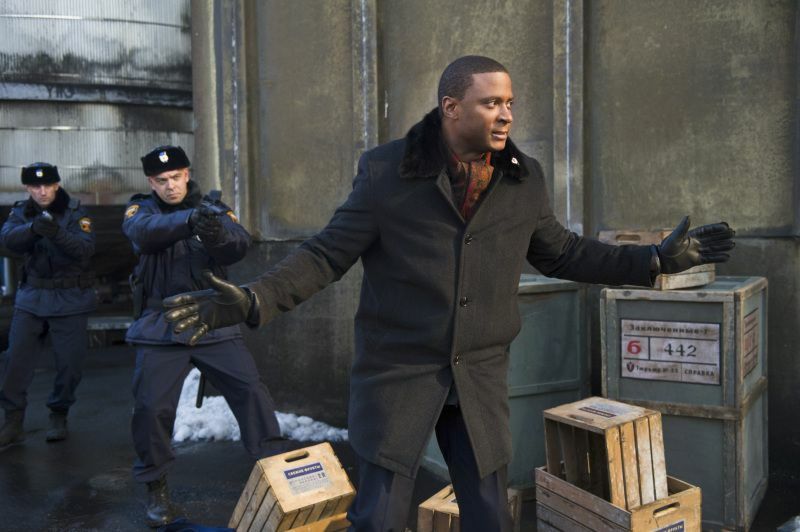 Pulled off the street during a routine night of watching The Arrow's back, John Diggle finds himself in the custody of ARGUS and under the supervision of Amanda Waller herself. It seems Lyla Michaels - John's contact with the organization - disappeared in Russia while following the trail of the assassin Deadshot. Waller's superiors think an extraction is too risky, leaving Waller to blackmail Diggle with the knowledge that she knows Oliver Queen is The Arrow in order to "persuade" him to take action. Even without the knowledge that his night-life is at risk (a fact Diggle keeps from Ollie and Felicity), Ollie is all too eager to help Diggle in rescuing his old friend. Oliver's contacts in the Russian mob can get Digg into the Russian gulag called 'Nightmare' but Diggle may have to turn to the man he hates more than anyone else in the world to get out. More, they have to carry out the whole operation under the nose of Ollie's business partner Isabel Rochev, who insists on accompanying them on their sudden trip to inspect Queen Consolidated's Russian holdings. Meanwhile, Thea is told that her relationship with ex-felon Roy could endanger her mother's case when she goes to trial. In the flashback, Oliver learns why Doctor Ivo is so interested in the island of Purgatory and the Japanese graves there. He also learns how Sara came to survive the wreck of The Queen's Gambit. The general style is reminiscent of several Mike Grell stories based around espionage and various Cold-War thrillers involving Americans needing to be rescued from Russian prisons. David Ramsey hasn't been given much to do this season as John Diggle, apart from making dry comments. Granting that he usually gets the best lines in each episode, there's been very little of Diggle as the man of action in Season 2. This episode rectifies that oversight, giving us a glimpse of Diggle the Lover as well as Diggle, Man of Action. First appearing in Legends #1, Amanda Waller has been the leader of many clandestine organizations in the original DC Comics Universe. Having lost a husband, son and daughter to violent crime, Waller dedicated herself to public service and earned a Doctorate in Political Science. She used the knowledge gained in her position as a Congressional aide to reactivate The Suicide Squad - a government program which offered super-villains time off of their sentences in exchange for working various suicide missions on behalf of the U.S. government. Waller also served, at various times, as a regional department head for the Department of Extranormal Operations, The Secretary of Metahuman Affairs and as The White Queen and Black King of the spy organization Checkmate. In the New 52 DC Comics Universe, Waller still serves as the head of The Suicide Squad and is currently the head of ARGUS. Little is known of Waller's background in the new universe, save that she has a background as a spy and was part of the covert-ops group Team 7 along with Dinah Drake, Slade Wilson, Steve Trevor and Cole Cash among others. Walller was original depicted as a short, heavy-set woman of middle years. Her New 52 incarnation is younger, taller and thinner by comparison, as is her Arrow incarnation. ARGUS (Advanced Research Group Uniting Super-Humans) is a national security group in The New 52 DC Universe officially charged with acting as a liason between the US government and organized superhero groups such as The Justice League. Unofficially, ARGUS is meant to study superhumans and look for ways to neutralize them should they become a liability rather than a benefit to society. The ARGUS in Arrow stands for Advanced Research Group United Support. The ARGUS squad that abducts Diggle uses the call-sign Strike Force X. In the original DC Comics universe, Task Force X was a government organization started by Harry Truman in 1951 to fill the void left by the retired Justice Society of America. The Domestic Branch of Task Force X was called Argent and the International Branch was the first group to be known as The Suicide Squad. Amanda Waller's call-sign with ARGUS is Mockingbird. Mockingbird was also the alias used by the leader of each incarnation of the government spy team called The Secret Six. A group of mercenary villains - including Deadshot - later appropriated the Secret Six name, receiving jobs from two separate figures who used the Mockingbird name. The second of these figures was Amanda Waller. Dr. Ivo seeks a lost Japanese super-drug called "Miracle". This may be a reference to Miraclo - the drug created by chemist Rex Tyler which gave him super-strength, speed, stamina and durability for one hour at a time, allowing him to fight crime as the Golden Age superhero Hourman. The abilities attributed to Miracle are almost identical to the powers granted by Miraclo. It is worth noting that there were rumors The CW was looking into a series based on Hourman. Perhaps this "Miracle" drug is planting the seeds for that storyline as the references to a particle accelerator in Central City seems to be setting the stage for The Flash. Moira's lawyer is identified as Jean Loring. In the comics, Jean Loring was also the name of the love-interest of the Silver Age Atom, Ray Palmer. She was also also a lawyer. The two were married and later divorced. This is not the first time Ollie and Diggle have taken a trip to Russia together. The two also journeyed to Russia to track down a person on Oliver's list in Issue #6 of the on-line Arrow comic. Coincidentally, this comic came out nearly one year to the day before this episode's original air date. Isabel Rochev, like her comics counterpart, is revealed to have been born in Russia. Unlike her comics counterpart, the Arrow version of Rochev was adopted by an American family at the age of nine. The comics version of Rochev grew to young adulthood as a slave in a Siberian diamond mine. Deadshot is revealed to have a twisted work ethic similar to his comic book counterpart. He takes pride in how he "never misses" and follows his contracts to the letter, only killing those mentioned in his contract - no bodyguards or innocent bystanders. He only kills for money, resents people like Diggle who take what he sees as business matters personally and tries to avoid killing in self-defense whenever possible. Deadshot tells Diggle that the only reason he killed Diggle's brother Andy was because he was paid to do so by a group called H.I.V.E. In the classic DC Comics universe, H.I.V.E. (Hierarchy of International Vengeance and Extermination) was a criminal organization who focused on mercenary acts of terrorism and high-profile assassinations. The super-drug Miracle was based on Japanese research into "stem cell genetic therapy" decades ahead of the other major nations during World War II. It is said to increase strength and cause rapid cellular regeneration. Anatoly Knyazev: It's full of violent psychopaths and killers. And that's just the guards. Felicity: What did you say? Isabel: Why do you try so hard to make me think you're a lazy idiot? I know you're not. Underneath that swagger, I see you pretty clearly. Oliver: Really? And what do you see? Isabel: You're intelligent. Driven. And lonely. Oliver: How do you see that? Isbael: Because it's what I see when I look in the mirror. Deadshot: You bust in, she's in there - what's keeping you from shooting me? Deadshot: That's the thing about honor, John. You can't turn it on and off. In the Previous On Arrow sequence, The Russian from 204 is confirmed to be Anatoly Knyazev - the Russian Mafia member whose life Oliver was said to have saved back in 103. We see him later in the episode where he is a nightclub owner who agrees to help Oliver and Diggle with their plan to break Lyla Michaels out of prison. Diggle knows who Amanda Waller is when she introduces herself. Waller knows that Oliver Queen is The Arrow. Oliver gives the name "Tommy" after Sara shakes her head when Ivo asks him his name. Knyazev and Oliver toast with the word "prochnost" - Strength in Russian - in reference to 204. Lyla is being held in a prison called Koshmar - the Russian word for nightmare. Lyla is revealed to be Diggle's ex-wife. Roy's arrest by Quentin Lance marks the second time he's been arrested in less than a month, the first time being in 202. Roy knows about how Quentin lost his Detective's badge because of The Arrow and there is a suggestion that the two realize that one another also works with The Arrow. Slade is revealed to have survived the attack in 203 but the right side of his body is badly burned. His right eye is still intact. Oliver is tricked into revealing Shado and Slade are still alive by Sara, but she uses her influence on Ivo to save Ollie's life after the fact. Deadshot is capable of killing a man by throwing an icicle into his back. Thea dumps Roy until Moira gives the two her blessing after learning that her lawyer asked Thea to dump Roy for Moira's sake. Oliver has a quickie with Isabel Rochev. Yet another reference is made on the news to the STAR Labs particle accelerator in Central City. A damn fine episode that plays more like one of Mike Grell's scripts for Jon Sable: Freelance rather than his work on Green Arrow. Would be perfect if it weren't for the subplot with Roy and Thea seeming totally tacked on. Still, it could have been worse - we could have been treated to more scenes of Laurel popping pills and acting erratically.